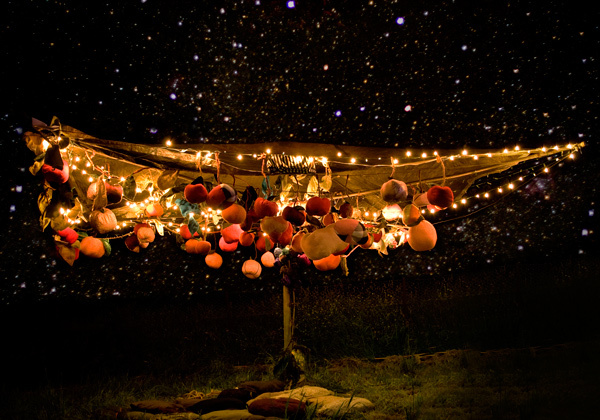 Michelle McCosker from Reef Knot talks to FK about her installation based artwork and what she’ll be creating with her team for our upcoming Sydney event! Tell us about your work with Reef Knot? 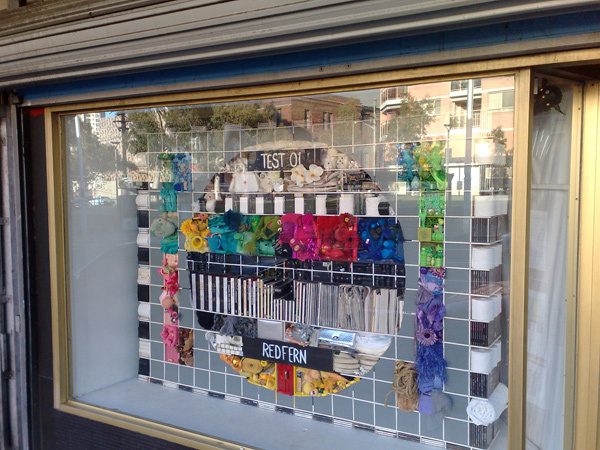 Reef Knot is an artist duo made up of myself and another guy called Alasdair Nicol. He’s really good at maths, physics and organising and I’m really good at coming up with crazy ideas and then arguing that they are feasible. So far we have mostly done installation work and public art pieces. We usually collaborate with other artists and like to call ourselves a ‘scalable artist collective’ which I think means we expand and shrink depending on what the needs of each project are. 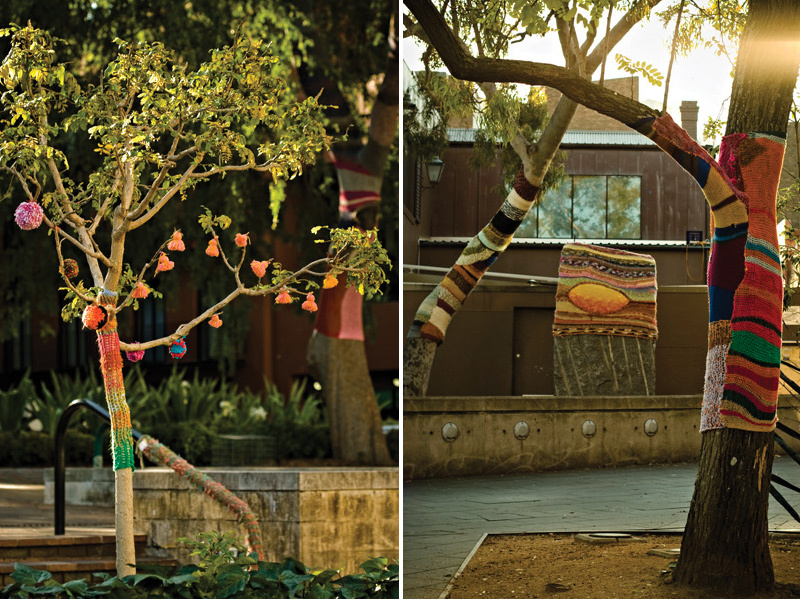 For example this year we did I Heart Kings Cross, a massive yarn-bombing of the Cross for Art and About, where we had over 200 people knitting, 12 knit-specific artists and 3 producers. Whereas earlier in the year we did a small installation called Test Pattern #1 which was just the 2 of us as well as an industrial designer… so yeah it varies a lot!! We also really like trying to make our artworks accessible and engaging to non-traditional art audiences. So far we have found that if we use recognisable objects or recycled materials pretty much anyone can have some kind of relationship with the work. What is your background and what lead you to installation based work? I always wondered how these loves could ever be combined or become a form of employment…. 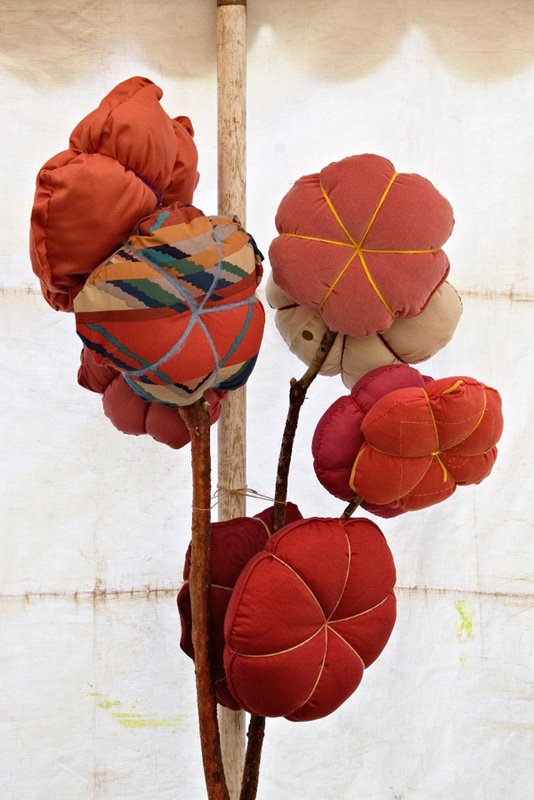 but then I bumped into my weaving + colour teacher and started making sculptures and textiles. I also co-founded Knot Gallery around the same time with my crew (including Al). Knot was wonderful because I got to curate and to me that was just a way of indulging love number 2. The more I curated the more I noticed people not really connecting with the art on the walls, especially non-artists who always said stuff like “oh no, I don’t know anything about art… I couldn’t possibly have an opinion..” . I kept wondering how to engage people and get them talking about the art in front of them and not be intimidated so I began to organise themed group exhibitions which were open to artists and non-artists to submit work in any medium. I hung the shows in lots of different ways so that they fitted with the theme, eg for the Fish exhibition I hung all the work on fishing line and fishing rods down the middle of the space with sinkers at the bottom of the threads. That way the entire exhibition was an ‘installation’ and the viewers became part of the show as they moved through the works. I asked musicians to make up fish songs and dancers to do a fish dance. 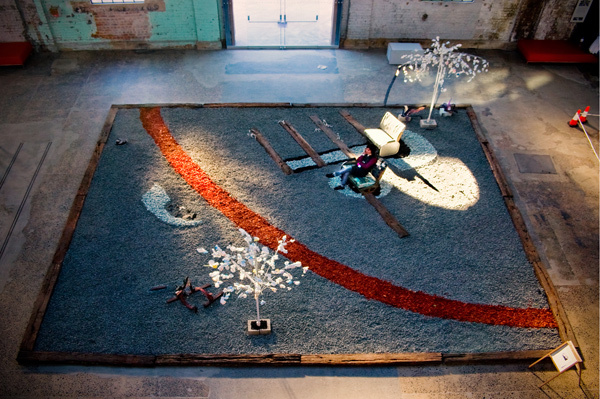 This created what we call an ‘immersive atmosphere’ which really helped people relax and enjoy the art. Another year I curated a Jewelry exhibition which I was really proud of. I used people all in white as ‘walls’ and hung the jewelry from them. When Knot closed in 2006 Al and I kept doing stuff with this same all-encompassing approach which naturally lead to installations and public art. We still have the same ideology though and I am still discovering different ways of engaging people in the public domain. I imagine that this will always be a challenge. What has been the most challenging project you have worked on? Definitely the most challenging project was The Sky is Falling! 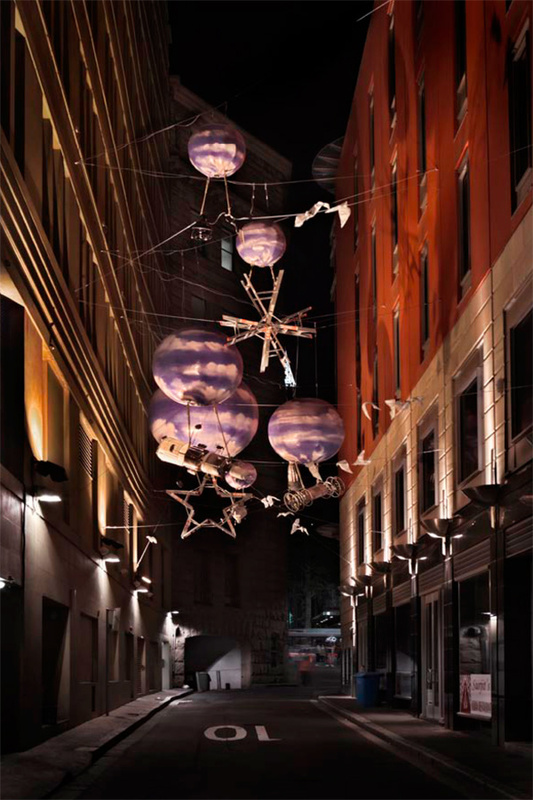 This was a multi-arts installation in Angel Place last year for By George! Live Lanes. The idea was to make it look like all the space junk humans had sent into outer space was slowly falling back to earth on a balloon made of a piece of sky. I know!! It sounds really simple. Well it wasn’t. As the whole thing was to be suspended and the objects were quite large and heavy we had to communicate with engineers, riggers, wind-engineers, council, OH&S safety officers, traffic controllers, inflatable company, 3-D digital modellers…… the list goes on. We got 9 different sculptors to make the pieces of space junk and all these pieces had to be signed off by the engineer. We had 2 wonderful sound artists make space-themed soundscapes too. Basically a massive amount of to-ing and fro-ing and keeping everybody happy whilst trying to do something which was in essence quite child-like. I learnt a.l.o.t from this project! One of the best bits was that I got to drive my friends ute through the city at peak hour with a giant rocket made out of a washing machine drum on the back which made me feel amazing. What are your favourite materials to work with and explore? Well, in my personal work I really love thread, sticks, paper and tiny tiny found objects that have been flattened on the road. These elements come together in so many different ways and they puzzle me a bit… so I keep trying to work them out. 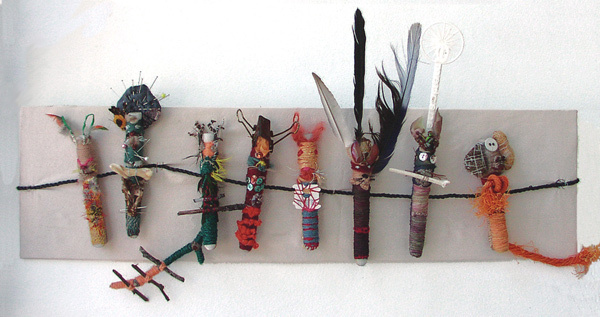 With my installation work my favourite things to work with are found objects, trying to incorporate textiles somehow as well as collaborating with other artists or using their work as an element within the whole. I love exploring the the idea that there is magic in the everyday because I think there is. Beautiful colours, textures that you’re allowed to touch, music, beautiful artworks and people who go through hard stuff and come out OK.
What I love most about large-scale projects is being surprised as well as meeting lots of amazing people who become friends. I also really love seeing an idea come to life because it always looks different in reality and you can never guess how that’s going to happen. What can we expect to discover at the upcoming Sydney Finders Keepers? Also the markets will be on and they are AMAZING!!!!!! Oh wow looks fantastic, I just LOVE all that color!